Web Japan > Kids Web Japan > Virtual Culture > Shodo > What Is Shodo? These days, most Japanese use pencils, ballpoints, or felt-tip pens to write letters and other documents. But the art of shodo (calligraphy), where an ink-dipped brush is used artistically to create Chinese kanji and Japanese kana characters, remains a traditional part of Japan's culture. Works of calligraphy are admired for the accurate composition of their characters, of course, but also for the way the brush is handled in their creation, the shading of the ink, and the balanced placement of the characters on the paper. Beginning in elementary school, students learn the basics of calligraphy in penmanship classes. At the beginning of each calendar year the children gather to take part in an activity known as kakizome, where they create calligraphic works symbolizing their wishes for the new year. Students practice their penmanship to improve their calligraphy, sometimes copying out works by famous calligraphers from the past. Some elementary and middle school students even go to special schools to learn the art, attending classes in the evenings and on the weekends to become able to write beautiful characters. The art of shodo originated in China and came to Japan in the sixth or seventh century, along with methods for making brushes, ink, and paper. In those days, calligraphy was an essential part of the education of members of the ruling noble families. But as time went by, the art spread among the common people as well. Nowadays calligraphy is not just an art form to be admired; people use it to write New Year's cards, and in other situations in their daily lives. 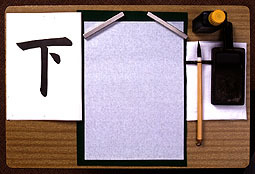 Different types of calligraphy include kaisho, or "square style," where the strokes in the characters are precisely drawn in a printed manner; gyosho, or "semicursive," which is written faster and more loosely; and sosho, or "cursive," a much freer, more fluid method where the characters' strokes can bend and curve. A wide variety of paper can also be used for shodo. In one kind of calligraphy called chirashi-gaki, for example, a traditional 31-syllable Japanese poem (called a waka) is written on a square piece of paper. The writer can begin the lines of the poem at different levels on the paper to portray the rhythm of the verse, or write in darker and lighter shades of ink to give a sense of depth to the words, making the work look almost like a landscape painting.